Epson XP-850 is a compact inkjet 4-in-one that offers everything that photo enthusiasts seek. It offers photo quality that lasts for generations with important add-ons which include WiFi, automatic duplexing, touchscreen, and mobile printing among others. Although it is a multifunction device, its footprint is small. It weighs 8.7 kgs and measures 390 mm in width, 339 mm in depth and 191 mm in height. The initial setup of the device is fast and easy to understand. It offers a big 8.8 cm colour touchscreen that allows you to preview photos and perform other operations easily. The Epson XP-850 ink cartridges are available in six colours that add depth to photos. Colour printing happens at a speed of 9 ppm whereas mono printing happens at a speed of 9.5 ppm. It manages many types of media including border printing, CD/DVD printing, automatic duplexing and 30-sheet ADF. The device supports PictBridge allowing you to print photos directly from the camera. WiFi and WiFi Direct is available for wireless connectivity. 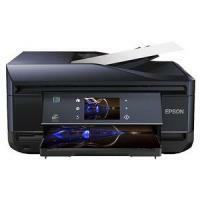 In addition, it enables mobile printing and Cloud printing via Epson Connect. The machine supports Windows and Mac operating systems. Epson XP-850 is not just a device for photo enthusiasts but also for those who run a small business. Along with printing, scanning, copying and faxing capability, it features ADF and automatic duplexing. Even the Epson XP-850 ink cartridges keep up with the affordability factor. It is a smart deal, especially for a small-scale photography business. Q. 2-3 months ago, I had purchased compatible Epson XP-850 ink cartridges. Is the quality of ink affected? Can I install the cartridges and expect the same printing results as before? A. If you have not opened the pack of ink cartridges then you do not have to worry about it. The shelf life of the cartridge is approximate 6 months if stored in a cool and dry place. You can install the cartridges. Q. Will I get lab-quality prints with Epson XP-850 printer? A. The printer uses 6-color Epson XP-850 ink cartridges with inkjet technology and hence provide printing resolution of 5760 x 1440 dpi, which is good enough for printing photos at home. Q. Is this printer compatible with the Linux operating system? Q. Can Epson XP-850 printer directly print the photos from Camera? A. Yes, by taking leverage of PictBridge port you can easily print your photos from the camera. Q. Will my personal details be shared with any third party? A. The personal details will not be shared with the third party for advertising purposes. But for processing your orders, we may share your required information with the fulfillment partners and the courier delivery companies. Q. I want to order a multipack of compatible Epson XP-850 ink cartridges. But unable to proceed after adding the product into the cart. Please help. Select the multipack as per your requirement. Click 'View Shopping Cart' and proceed to checkout. A form will appear. Fill the required information. Agree to the T&C and then click 'Place Order Now'. In case of any problem, you can call us at 048 30833221.